Clyde's Martin McNiff battles for possession with Stenhousemuir defender Ross Dunlop (pic by Alan Murray). Clyde interim manager Tony McNally paid tribute to his side’s second half display as they held on for a 1-1 away draw at Stenhousemuir. Under-20 coach McNally was placed in temporary charge of first-team affairs following the departure of Jim Chapman. The home side were dominant in the first half and enjoyed the game’s first clear opening, with Clyde goalkeeper Blair Currie forced into a fine diving save to keep out a Mark McGuigan header. However, it didn’t take long for the home side to open the scoring. A deep cross found its way to McGuigan, who was hauled down by Jordan Stewart, with the decision made by referee David Dickinson on the advice of his assistant. The visitors raged over the award, but McGuigan dusted himself down to tuck the penalty low past Currie. The chances kept coming for the home side, with Stenny manager Brown Ferguson unhappy that his side were not awarded a second spot kick after McGuigan tumbled in the box under Currie’s challenge. The Bully Wee were lucky to hang on to half-time just one goal down, but re-emerged as an improved side after the break with the words of McNally ringing in their ears. Their strong start was rewarded as a corner was flicked into the path of David Goodwillie, who drove in from six yards for his seventh goal of the season. 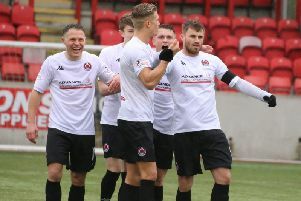 Clyde grew into the second half, with long-range efforts from David Gormley and Smart Osadolor testing home keeper Chris Smith before seeing out the game for a good away point.